Todays blog is going to be different to my other blogs. I am going to show you all a video tutorial on how to make a ribbon wreath for christmas using our gorgeous sage green satin ribbon. I have finished off the wreath with a simple ribbon bow made from red grosgrain ribbon. All the papers used for this design are part of the Pepper Christmas Party Collection pack which i bought last year from a craft show. 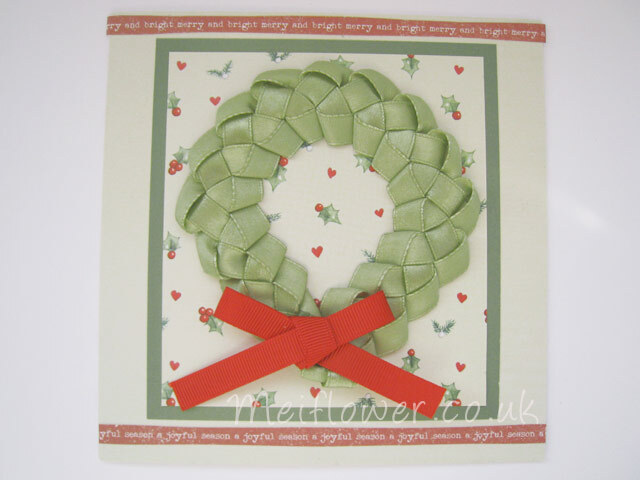 So have a go and try it with different colours of ribbon, I’ve used 10mm wide sage green ribbon because at the moment its my favourite colour. If you get a chance send in a pic by e-mail of your finished wreath, I would love to see your final design. This entry was posted on Tuesday, September 27th, 2011 at 1:20 pm	and is filed under Christmas Cards. You can follow any responses to this entry through the RSS 2.0 feed. You can leave a response, or trackback from your own site. Fantastic post Mei, I was at Ally Pally watching the demo and I really enjoyed it and thank you for letting me have a try as well. Think I’ll go buy some sage green ribbon now ! Oh WOW Mei. What a brilliant tutorial, and I am definately going to have a go at this technique soon. Thank you for sharing. Happy crafting. What a brilliant tutorial – very different and effective. I must have a go and as you suggest use different colours, although I do like your sage green ribbon. Your products are always first class along with your service. Hi. Nice to meet at Alexandra Palace. Good to watch the expert at work. I like the wreath very much, thanks for the lesson. Wonderful! thank you for a great idea, noticed on your website you’ve got the emerald green ribbon think i’ll try it with that and see how it goes. Great tutorial video, I made these for christmas cards last year and they were a great hit! Just made the wreath and it’s lovely. Thanks for your excellent tutorial. 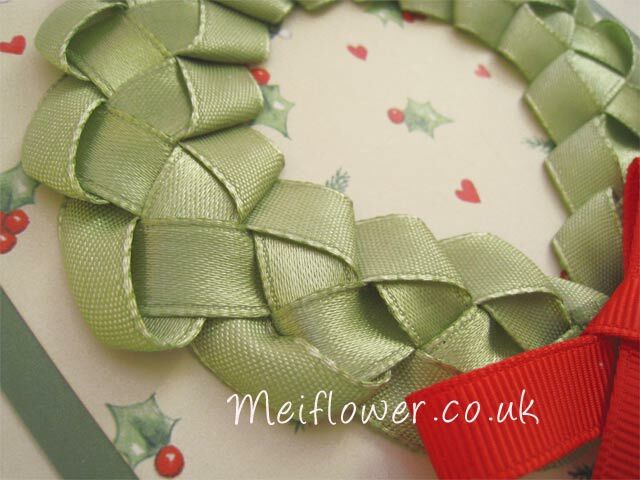 Hi, thank you so much for the ideas yesterday in Belfast Craft Fair, I loved the hairband idea and the Christmas wreath – I thought the green ribbon and red ribbon would make lovely covers for cheap napkin rings for your Christmas table or other colours for more contempory. I was making a wreath last night just to make sure I had the technique right. Hi Mei just wanted to say thanks for the great tutorial, i will have to try making this. I’m now a follower of your lovely blog. I’ve just made this using lilac ribbon and attatching it to a headband, using double sided tape, it looks great. I had a go at your stand at the Hobbycraft exhibition in Glasgow SSEC at the weekend, bought the ribbon from you and couldn’t wait to try it out! Now just need to knit a matching jumper for my wee girl with the yarn I bought on the same day! Lovely wreath. I will have to try this. Watched your demo at the NEC went home practised it then went to my usual crafting class and showed my class mates how to do it. By the way loved your demo and your other cards. Watched your demo at Bluewater and you were very patient with me. You had to show me several times and then you kindly let me have a go and I have been practising ever since. It’s very clever and beautiful. Thank you. Thank you so much for sending the details of this fab use of ribbon. I could only spend a short time at the Craft Show on Sunday but I am so pleased I found you. Very clear and understandable instructions which is great as I can’t do written ones. Don’t worry Donna it’s easy, once you get going you won’t stop! Hi Cathlene, I’ll be posting a video soon on how to do that ! I have now been able to show my sister how clever you are. She is delighted with your work and says thank you for sharing.